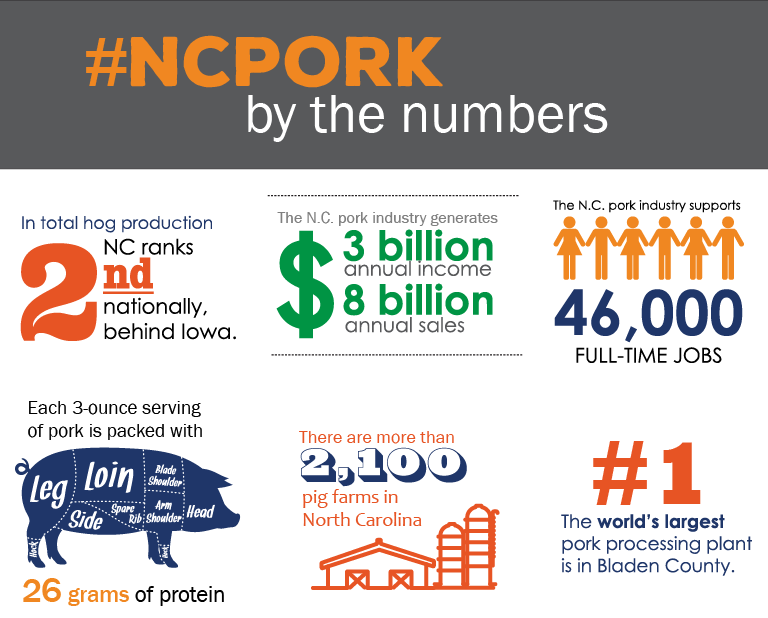 The vast majority of pork products produced in North Carolina stay right here in the United States. But there is a growing demand for American pork around the world. That is a testament to the quality and safety of the food we produce. It also reflects an increasing appetite for pork, which is the world’s most popular meat. Pork is the world’s most popular meat. The U.S. exports nearly $6 billion worth of pork each year. North Carolina accounts for about 10% of America’s pork exports. Each year, we export about $600 million worth of pork, including slabs of bacon, pork tenderloins, ham, and more exotic pork products not commonly found on our menus here at home. Much of our pork goes to our neighbors in Mexico and Canada. Other popular trading partners for North Carolina pork include Japan, Korea and Hong Kong. Asia is a growing market that now imports more than twice as much American pork as the rest of the world combined. More than 25 percent of all North Carolina pork is exported. Exports allow our farm families to provide safe, nutritious protein to families across the state and around the world. Exports keep agriculture and our rural economy here at home strong and healthy. Well Raised. Well Traveled. The Series. The “Well Raised, Well Traveled” videos featured on this page highlight North Carolina’s pork industry and local farmers who care for our animals. The videos also provide a look at how other cultures value North Carolina pork. You can see how restaurants on the other side of the globe are using our pork to create dishes that delight diners. These videos were produced in partnership with the N.C. Department of Agriculture and Consumer Services’ International Marketing Section. North Carolina is the nation’s second leading producer of hogs. The state has more than 2,100 farms that raise about nine million hogs each year in a safe and responsible manner. Our farmers take tremendous pride in producing high quality pork products, regardless of whether they are going five minutes down the road or halfway around the world. An estimated 25 percent of the pork produced in North Carolina is exported. Mexico is one of our top trading partners by volume. In 2015, the United States exported more than 718,000 metric tons of pork and pork products, valued at $1.26 billion, to Mexico, making it the largest volume market and the second largest value market for U.S. pork exports. Japan is one of the world’s top pork producing countries, and it imports more than $1.5 billion of U.S. pork every year. Pork is by far the most popular meat in Japan — families consume about 2.6 million tons of pork each year — and it remains one of the United States’ most important trade markets. Hong Kong and China combine to account for nearly half of the world’s pork consumption. While China is the largest pork producer in the world — it raises more than 450 million hogs each year— the country imports about three million tons of pork annually. It imported more than $1 billion of U.S. pork in 2016, which ranks as the third most valuable market for U.S. exports. South Korea is one of the world’s largest pork importers and is an emerging market for U.S. pork. The United States supplies about one-third of South Korea’s pork imports. The country imported $365 million worth of U.S. pork in 2016; imports are on the rise in 2017. The N.C. Pork Council strongly supports free trade agreements that will expand the market for U.S. pork exports by eliminating tariffs and other trade barriers. Exports add significantly to the value of each hog, boost the bottom line of American pork producers, and support nearly 10,000 local jobs. North Carolina’s pork exports have increased ten-fold in the past 20 years. The United States is the world’s largest exporter of pork, providing $6 billion of pork products to more than 100 countries. A lack of trade agreements with other countries, especially in Asia, has led to increased competition from other leading pork exporters in recent years. 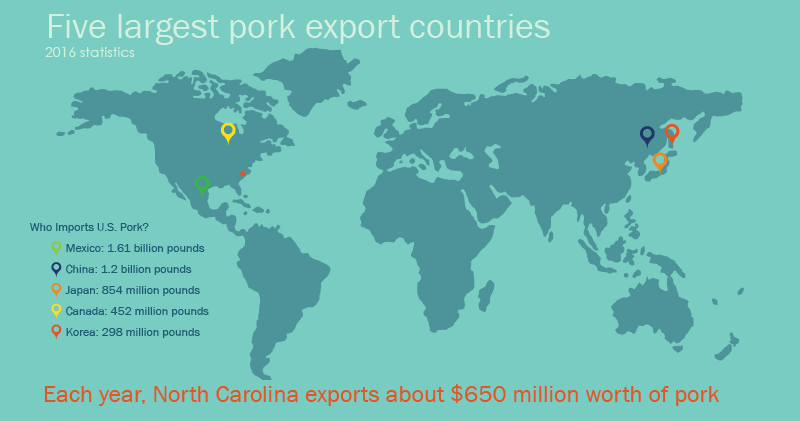 The importance of exports isn’t unique to North Carolina’s pork industry. North Carolina farmers are also among the nation’s leading exporters of tobacco, soybeans, poultry and cotton. Learn more about North Carolina’s agricultural exports. Exports raise the value of each hog sold and boost the bottom line of pork producers.